Congratulations to all the winners, and thank you to everyone who entered! Get Ready for the Riley Blake Fabric Challenge Spring 2016! Who’s ready for another Riley Blake Fabric Challenge? Our next fabric is from a new Riley Blake line called Sashing Stash designed by Eleanor Dugan, and it’s so incredibly versatile! Just take a look at this video to see some of the different ways you can use it! The sign up form will be emailed to members on Dec. 19 at 10am Eastern, 7am Pacific (here’s a handy time zone converter if you don’t live in those zones). As always, we have many more members than we have available fabric, so register early! This time around, shipping will be slightly different than previous fabric challenges. If you are part of a local guild, your fabric will be shipped to your guild of choice, and your leadership team will distribute the fabric. If you are part of two guilds, please specify which guild you would like to receive your fabric from. If you are an individual member, your fabric will be sent directly to you. Fabric will ship in February 2016. You must make something quilted. 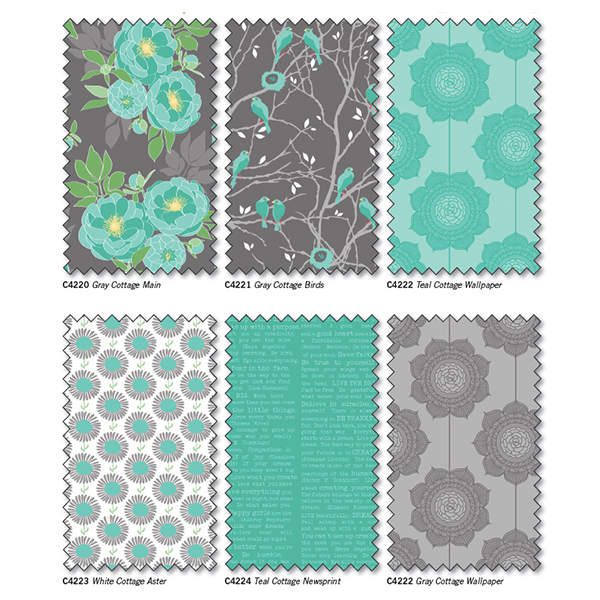 You must use prints in the Sashing Stash collection. Participating members will receive a cut of the black and white variety fabric (3/4 yard), but you are welcome to purchase the fabric in additional colorways. You may use any Riley Blake solids in addition to the Sashing Stash fabric. 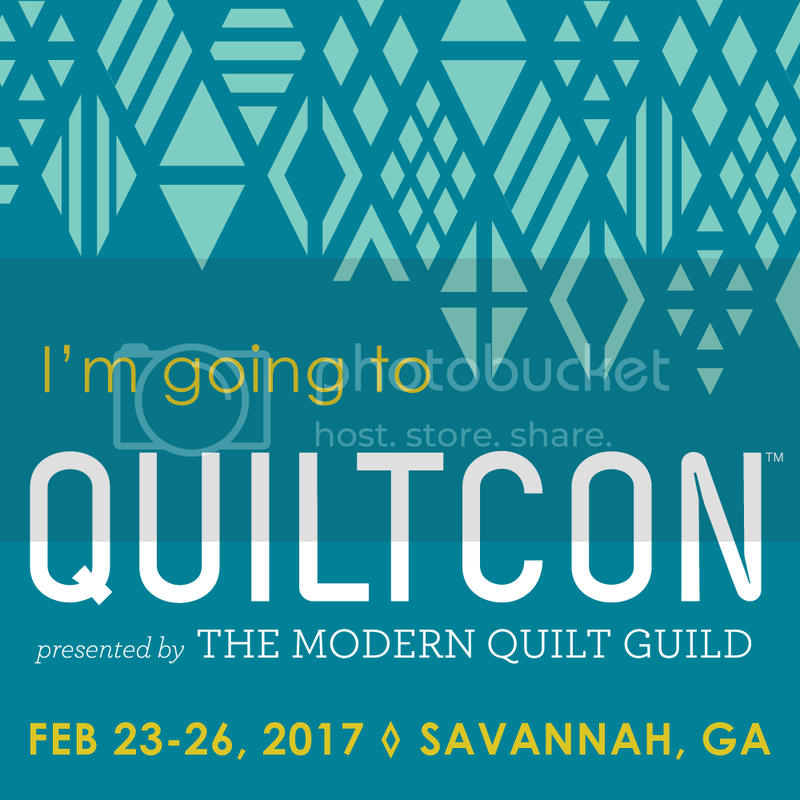 If you don’t receive fabric through the MQG signups, you are still able to participate in the challenge! Simply purchase the fabric from your local quilt shop or one of these retailers. We will announce the top three winners in May 2016.Winners will receive a prize from Riley Blake Designs. 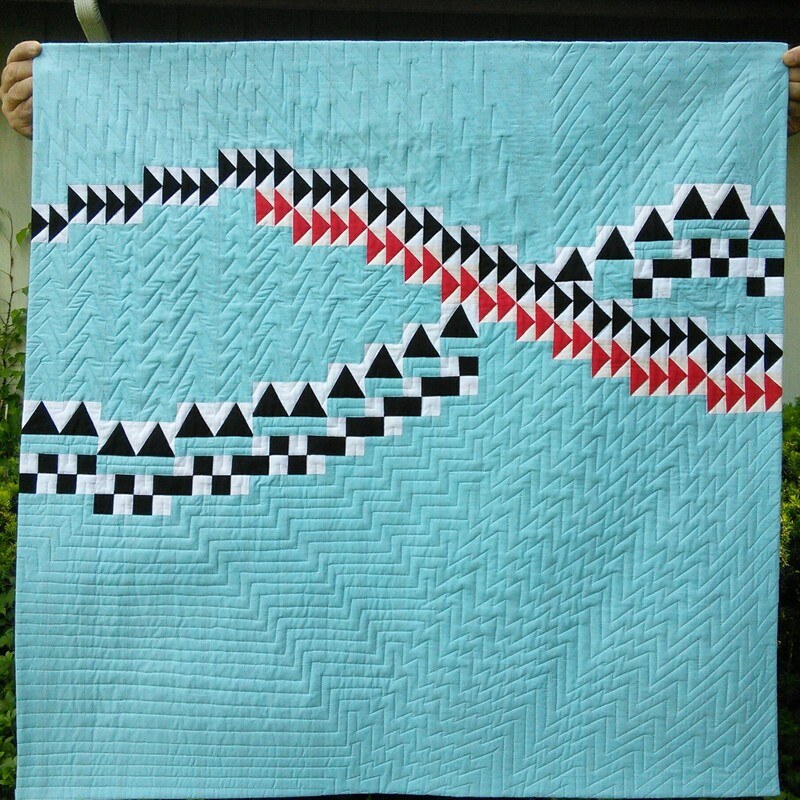 MQG members can submit a quilt using the submission form on Community. We also encourage you to share your work on Instagram, Facebook and Twitter using the hashtag #mqgfabricchallenge — and you can also share photos in the MQG galleries and on Pinterest! The deadline for submissions is May 31, 2016, and winners will be announced in June 2016. We can’t wait to see what you create! Remember to share your work using the #mqgfabricchallenge hashtag. Happy sewing! 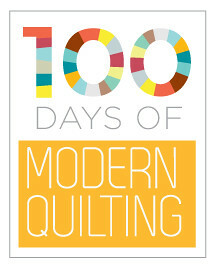 If you have questions, please email info@themodernquiltguild.com. It’s finally here! The winners of the Riley Blake Fabric Challenge have been announced! Thank you to everyone for your submissions — we were blown away by this year’s entries! Staff members from the MQG and Riley Blake Designs worked together to choose the finalists and winners, and it was one of the most competitive challenges yet. This year we’re also announcing the finalists. Congratulations! Congratulations to all the winners, and thank you to everyone who entered! 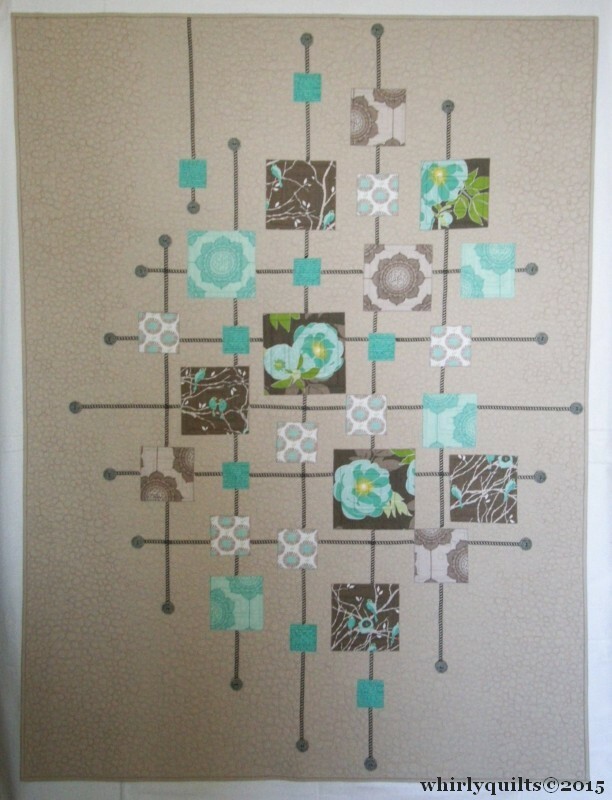 You can see all of the submissions in the Riley Blake Fabric Challenge gallery, here. We are so pleased to announce the three winners of the Michael Miller Fabric Challenge. The inspiration for my quilt, Picnic Petals, was the Petal Pinwheels fabric collection as a whole, but specifically the Tile Pile pattern. Going into the challenge, I looked at a lot of photos of pinwheels, flowers and sketched elements of these objects to study how I could convey organic shapes and movement and a block quilt. 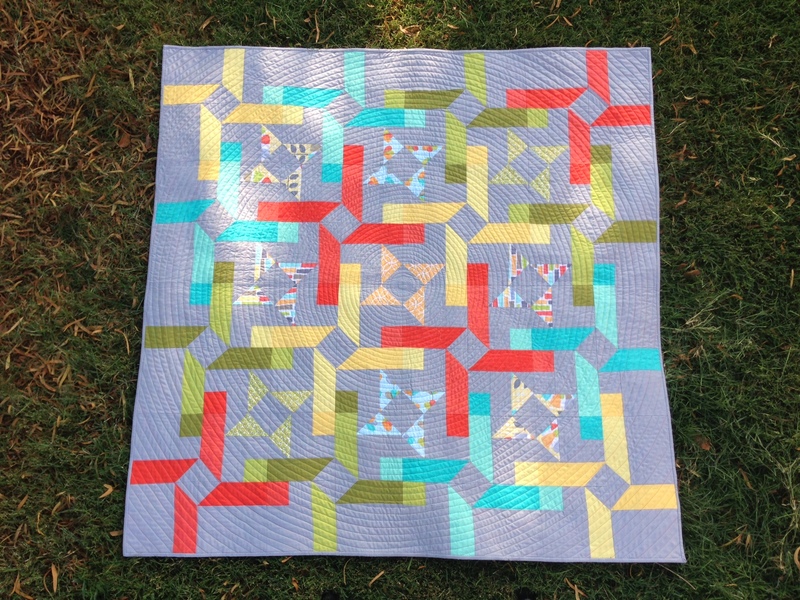 As a relatively new quilter (only 2 years), this was the first time I worked with curved elements. This challenge encouraged me to work with fabric patterns and techniques I might not normally work with. Many thanks to The Modern Quilt Guild, Michael Miller Fabrics and the wonderfully-talented women of the newly formed Southern Connecticut Modern Quilt Guild. They are constant source of inspiration and knowledge for me. 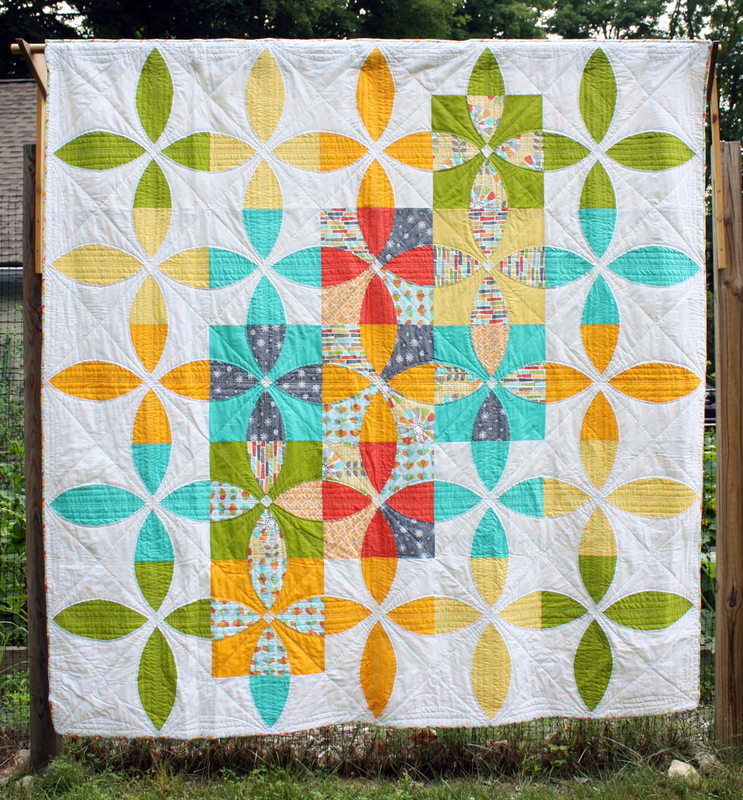 My inspiration for this quilt started with the name of the collection, Petal Pinwheels. I knew I wanted the quilt to show a lot of movement. 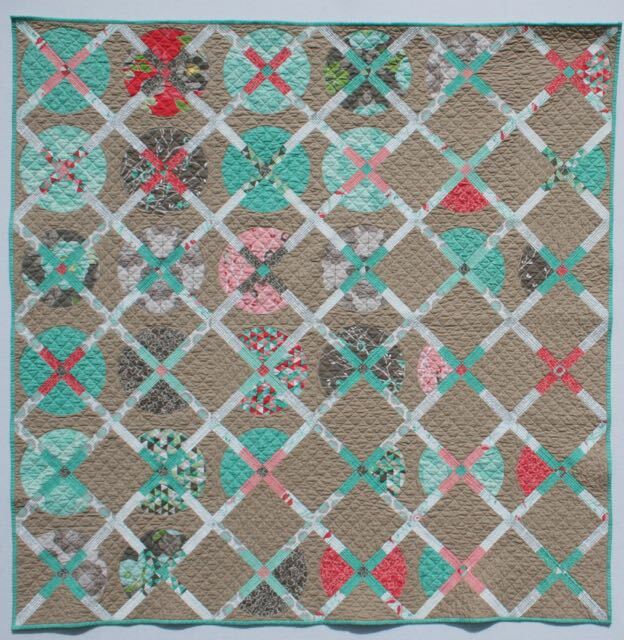 I used a combination of colors from Cotton Couture solids, Petal Pinwheels fabrics, and a few from my stash to create the geometric design. 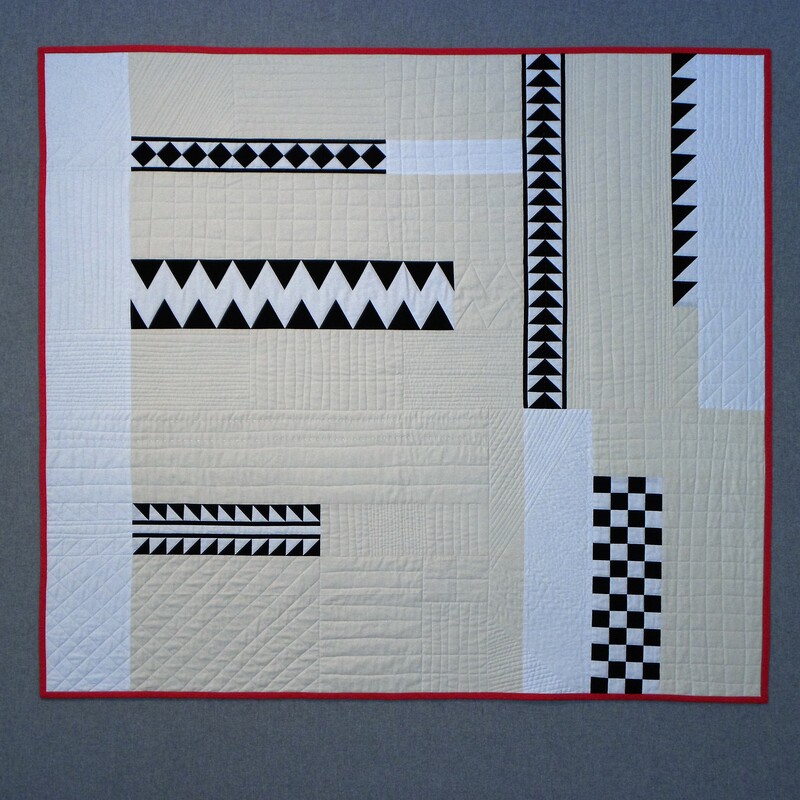 I wanted to offset this with contrasting quilting to add another layer of movement. I quilted it using coral, yellow, green and turquoise 50 wt. Aurifil. The lines started more compact and then spread out like a ripple in water. The back is leftover scraps and dark gray dumb dots. It is a simpler design, but just as fun as the front. This was a very fun challenge to put together! My inspiration for this quilt came while browsing for a new kindle cover. I was drawn to a piece of art and knew I had to make it into a quilt. 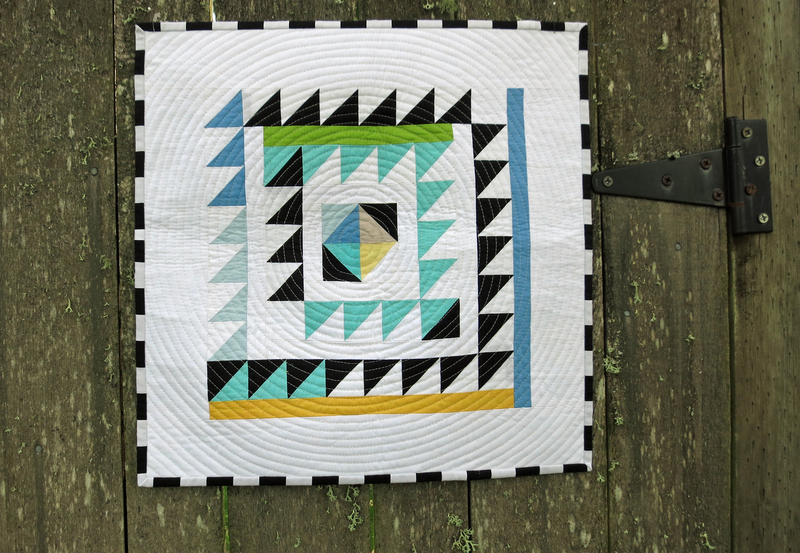 This is the most fun I have ever had throughout the entire quilt-making process, from design to choosing just the right solids, and even quilting concentric circles and burying hundreds and hundreds of thread ends. Sewing the binding on (by hand, which I hardly ever do!) happened during an emotional time for me. As I thought about what to name it, several people suggested names related to the sunrise. I was reminded of an old Broadway song and knew that “with the sun in the mornin’ and the moon in the evening” I’d be all right. And I feel happy every time I look at it hanging on my wall. There were so many amazing entries to this challenge that a congrats is due to all of the participants. Thanks so much to all of our wonderful and talented members for making this another successful challenge. Riley Blake Designs: Fabric Challenge WINNERS! It was a tough choice for the Riley Blake team but they did it…thank you again to Riley Blake Designs for their continued support of the MQG. 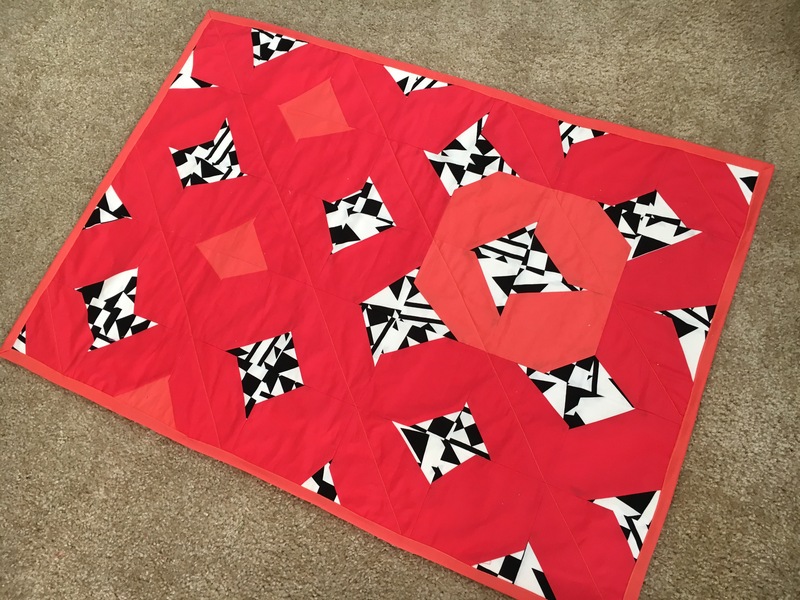 We have loved working with the Modern Quilt Guild on this challenge and have been amazed with all the beautiful and unique designs created out of 6 basic fabric prints. 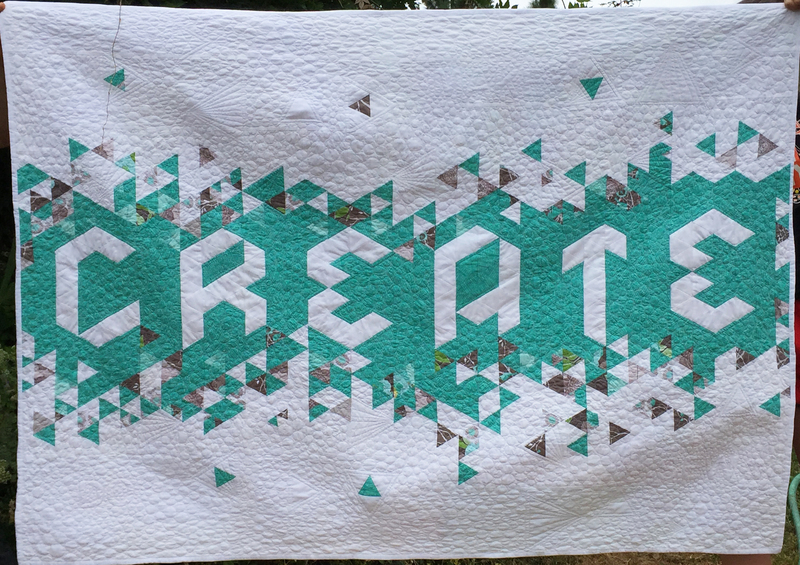 Kudos to everyone who entered a quilt and congrats to the winners of the challenge. Well done. 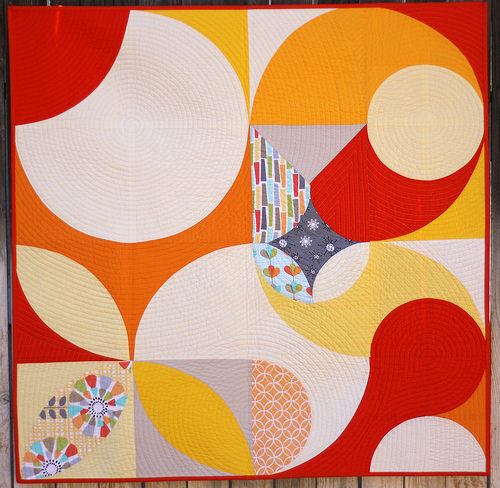 1st place Doris Brunnette- The more we look at this quilt the more we like it. Interesting placement of color suggesting movement of the quilt. The detailed quilting added to the overall look. Splendid design. 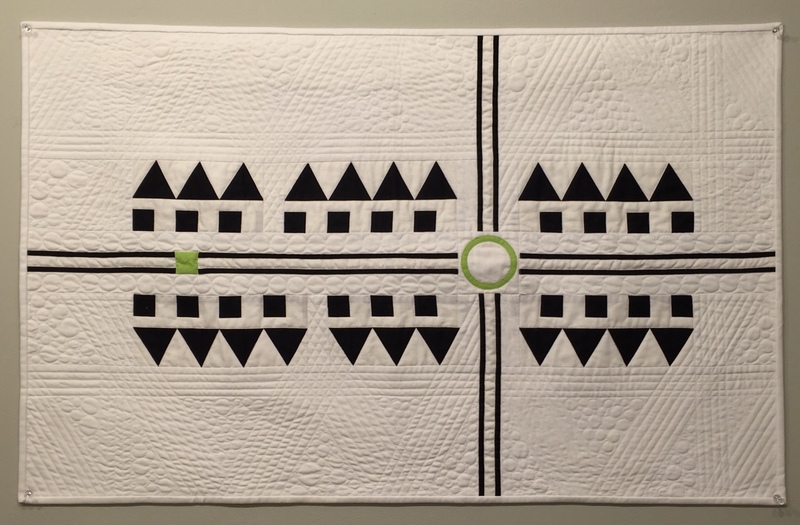 Dorris is a member of the Des Moines Modern Quilt Guild. 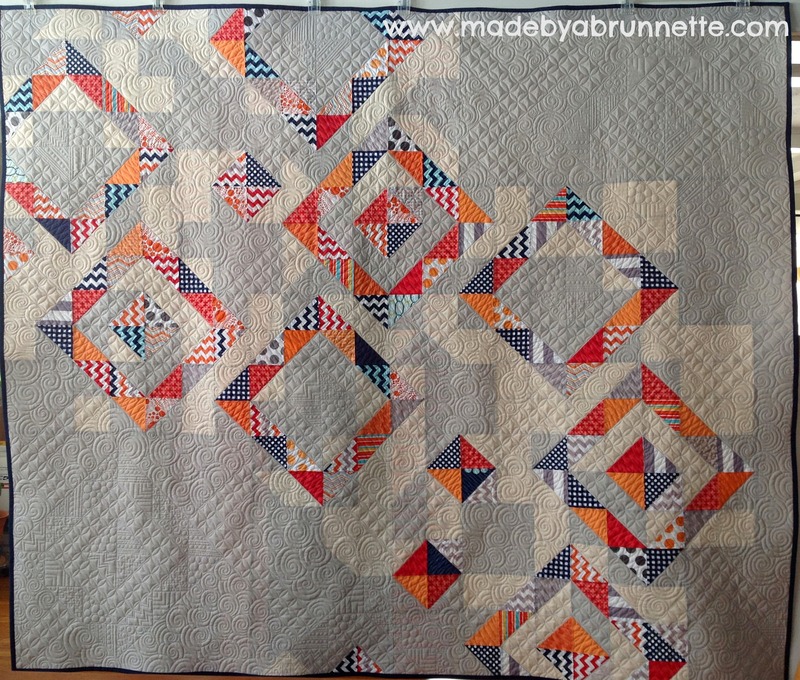 She blogs at Made by a Brunnette and is also co-owner of a quilt pattern design company, Row House Creations. Her partner Trina Kirkvold (also from Des Moines, Iowa) is the long-arm quilter that quilted this quilt. I loved the possibilities of the fabric swatches we were given; and I changed “my plan” dozens of times before I ever cut into the fabric. Finally in late January, I started cutting squares for half-square triangles with no real plan in sight. But as I sewed and trimmed the HSTs, an idea came to me (inspired by the frost on my studio windows). I sat down and drew this quilt out on graph paper. The warm tones contradict the “frosty” inspiration, but the two-tone background gave me the exact outcome I was imagining. I was both honored and humbled to have my quilt selected as the winner. There is a lot of talent in this Guild, and so many of the other entries WOWed me! 2nd place Shannon Page- Unique idea using feathers as the focal point. Excellent use of color. Very artistic. Shannon is a member and president of the Dallas Modern Quilt Guild. She’s a prolific sewer and you can follow along with her on Instagram. Pattern by Anne Sullivan and can be found here. 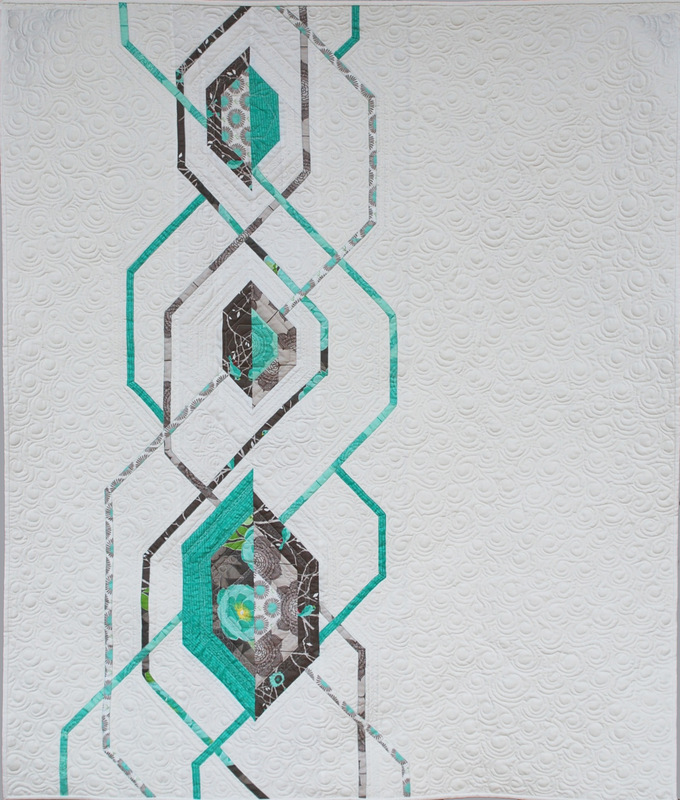 3rd place Melissa Corry- There is a great overall color balance to this quilt and we loved the use of negative space. We liked the water drop ripple affect of the quilting, that is off center, which is a beautiful edition to the design of the quilt. 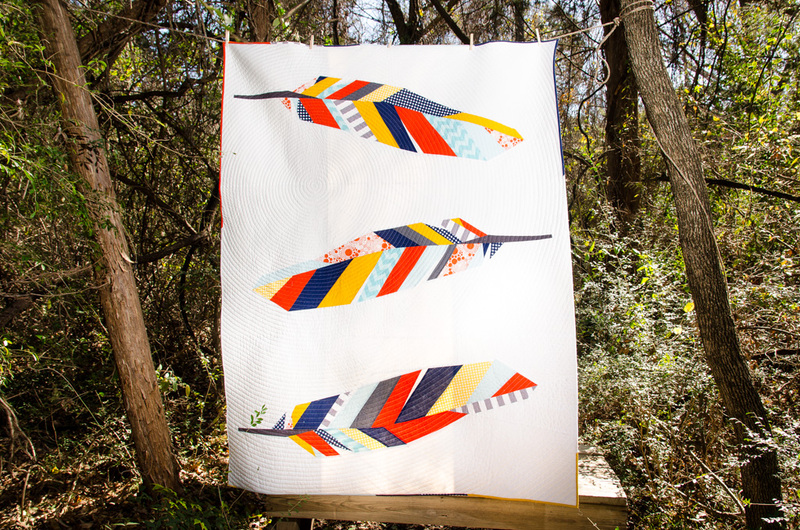 Melissa Cory is an Individual Modern Quilt Guild member. She’s an avid blogger and can be found at Happy Quilting. 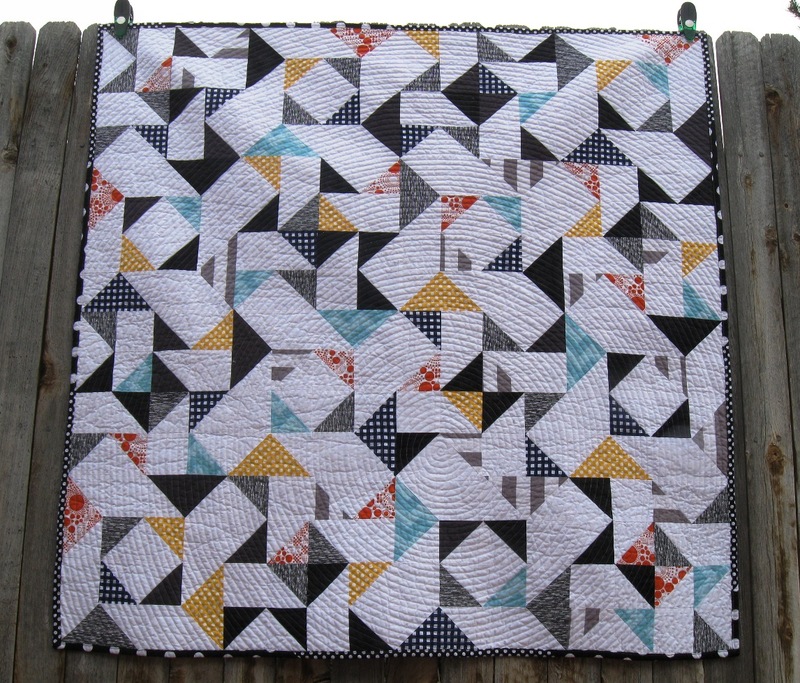 Since the Riley Blake Challenge was all about Basics, I designed this quilt to be made entirely of my favorite basic piecing units: squares, half-square triangles, and flying geese. Back to Basics has quickly become an all-time favorite of mine and I am over the moon excited that it is a favorite of Riley Blake’s as well. Become a member of the MQG! Check out the benefits and join now. 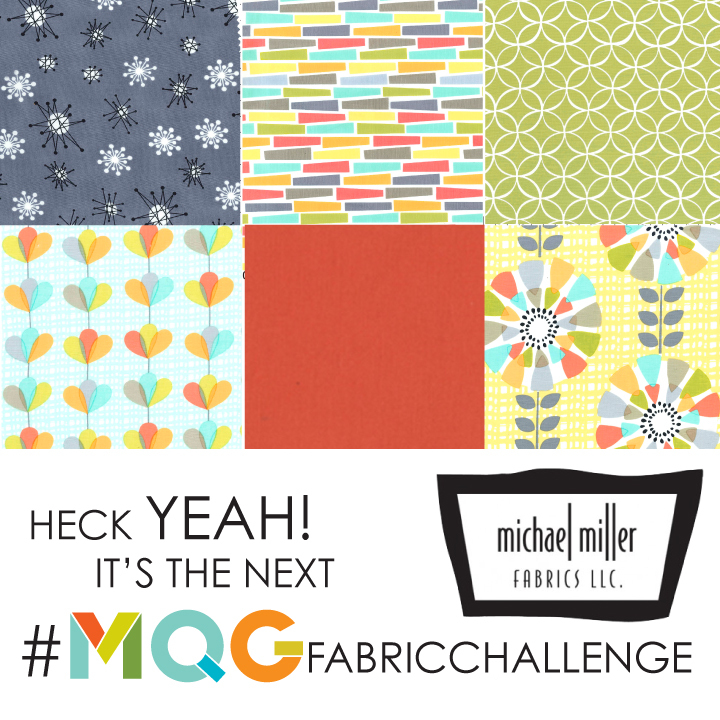 We are so excited to announce Michael Miller Fabrics as our sponsor of the 4th annual MQG members fabric challenge. The fabric we will be using is a brand new collection called Petal Pinwheels. A fun graphic collection that will cut up so well. The challenge runs from March 2014-June 23, 2014 July 25, 2014. Winners announced July 8, 2014 Aug 1. This year we will pick 3 winners. Each one will receive a posting on our blog and “A year of Free Fabric”. Every month for a year we will send you a “Goody Box” filled with fabric from our newest collections. 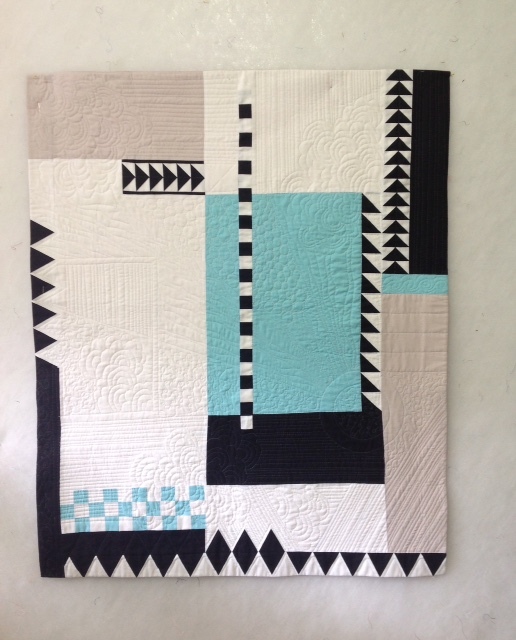 Check out the last Michael Miller fabric challenge winners here.